dessert girl: Ace of Cakes: Who Knew?? Ace of Cakes: Who Knew?? I’ve never been a huge Ace of Cakes fan. I’ve watched the show before and, although I’ve enjoyed it, there’s part of me that gets a little overwhelmed by all those giant sculptural cakes. There’s always this little voice in the back of my head wondering, What do those cakes taste like?? I wasn’t sure how I felt about the whole Ace of Cakes phenomenon, but then I came across this picture on Vince Lupo’s Flickr page and everything changed. 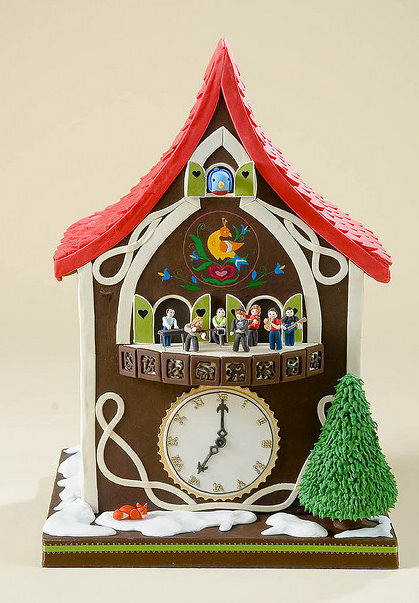 The moment I saw this adorable cuckoo clock cake I was head over heels in love! (Check out the fox in the bottom left-hand corner!) And it didn’t stop there! I continued to scroll through Lupo’s images and discovered photo upon photo of some of the most darling cakes that I have ever seen! What wonderful person made these cakes??? And where can I see more of their work?? You can imagine my surprise when I discovered that they were not made by a Scandinavian baking goddess or a hip do it yourselfer, but by Ace of Cakes!! No way! So, I guess I am now, an official Ace of Cakes fan. I’ve actually heard that there cakes are pretty tasty, once you remove the rubbery fondant layer. 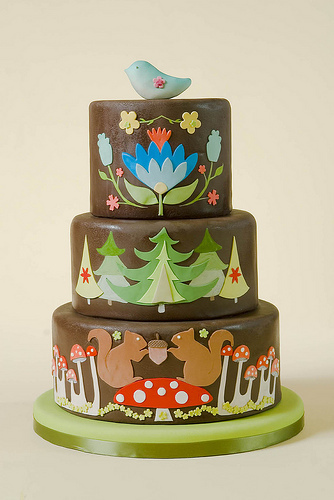 To check out more pics from Vince Lupo's Ace of Cakes photostream, click here. For more on Ace of Cakes, the show, click here, and here for their bakery's website. These are absolutely beautiful. They are perfect in every way. I just love looking at these cakes. Thanks for the shout-out! I worked with Duff and Co when they were making their book, and most of these photos were for that project. Definitely agree with you that they are all true artists at Charm City Cakes, and each person there has their own unique style and strengths. Here's a YouTube link to the show about the book. I'm the bald guy with the camera! Forgot to mention that the three cakes depicted on your blog were done by Anna Ellison at Charm City Cakes. 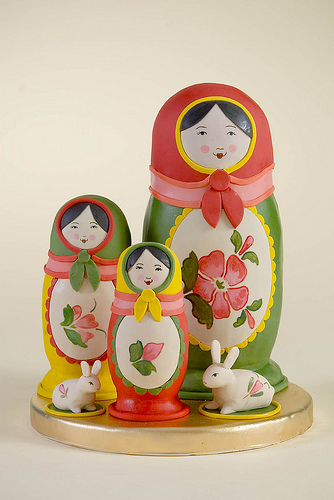 I LOVE the Russian stacking dolls cake. How clever is that! Cute to boot.